There has always been an air of mystery and peril surrounding the 1922 discovery of a child-king’s mummified body and his treasure trove meant to accompany him into the afterlife. Even if you’ve never seen Indiana Jones or taken an introductory anthropology course in university, every kid growing up dreamed of exploring lost ruins and stumbling across some ancient artifact – the lure of buried treasure. Silver Oak Casino’s version of history is steeped in the same kind of loot, and the same kind of adventure. It’s no surprise then that one of their most highlighted online slot games should center around Tutankhamen. Boy Kings Treasure is half gambling software and half Atari nostalgia – the amount of time they’ve taken to impart interactive gameplay feels reminiscent of the 2D videogames of the 80’s and 90’s, and feels just as difficult (and rewarding). Although there’s a number of stellar slot games available at Silver Oaks, Boy Kings Treasure sets itself apart by tapping into the mystique surrounding the curse of Tutankhamen, and I found it to be a very attractive ‘hook’. On top of that, there’s a special bonus round that can be unlocked by lining up the Scatter Symbols that appear after each spin – aptly, they’ve chosen the Egyptian asp as the key to unlocking the bonus round. As an avid gamer, the idea of unlocking a “secret level” is also really appealing, especially in the context of a casino game, where a player is awarded fifteen free games. This doesn’t happen very often, but there’s also a boss. In this case, the mummy awakens, and if he shows up the prize can range from 2X to 16X the triggering bet. I thought the interplay between this Wild Symbol showing up in free games vs. normal games added a new dimension to the game – if King Tut shows up he can be substituted for any other symbol, but if he comes up in the free bonus games he becomes a multiplier. 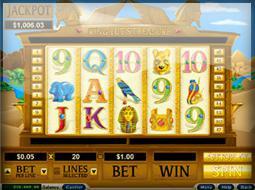 Like many of their table games, Boy Kings Treasure also have a progressive jackpot. These generally involve a small portion of each spin being devoted to a pot outside the game, so the more spins the higher the potential winnings. The beauty of progressive jackpots is that they keep growing until someone eventually wins them, which adds a cutthroat element to the gameplay. Whether or not you believe in curses, Boy Kings Treasure is an equalizing force in the online casino world. All of Silver Oak Casino’s games subscribe to RNG (Random Number Generator) software and third party audits, so the risk and the reward have the same equitable spin of fate, and taps into a pervading and enigmatic mythos. It’s no wonder that Vegas boasts a giant Sphinx!